The tough part about brand storytelling is so many of us think we are doing it but we aren’t. Instead, we come off as the socially awkward guy at the cocktail party – the one you see in the corner of your eye, whose presence you feel and want to repel. So you do everything in your power to avoid them. If you wonder why your own stories aren’t doing the work you think it should be doing, this might be the reason. You have become the very thing you spend a lot of time avoiding. One of the biggest mistakes we make is to mismatch the story to where our protagonist is in their journey, in other words, where our buyer is in their own journey to buy (or not) from you. We see examples of this mismatch every day. Like when I visit a website for the first time and get assaulted by a survey pop-up box – when I haven’t even had a chance to make an opinion to share. Or even worse, when I’m asked for an email to even enter the site. It’s like standing at the door of your store and requiring personal information before we can enter. It’s like proposing marriage on the first date. 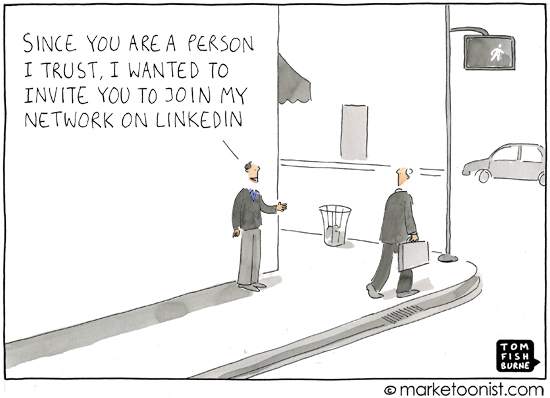 It’s like standing on the street corner and asking people to connect on LinkedIn (see above). We aren’t ready, and you are scaring your potential buyers off. That’s mismatching the story to where your buyer is in their journey. Getting this right requires a knowledge of your protagonist (the buyer) and their buyer journey. Hammer Nutrition gets it right and you can learn more in this video I decided to make on the topic. But first, I am excited to be speaking at Hubspot’s Inbound Conference September 26, 2017 in Boston on How to Use Story to Influence Action. Tickets are on sale now, and you can get $200 off an All- Access Pass through September 24 – just hit me up for the code via email (if you are receiving this by email or by contacting me here. They anticipate 21,000 business professionals who will learn from education sessions like mine and see an inspiring lineup of keynote speakers including Michelle Obama (!!!!!!!!! ), Piera Gelardi & Brene Brown. Please let me know if you’ll be there and want to meet up. What is the YouTube version of Murphy’s Law – any options for a thumbnail cover will be your most unflattering options. So hurry up and hit play so you don’t have to look at the goofy look any longer. I welcome your added thoughts and questions in the comments.